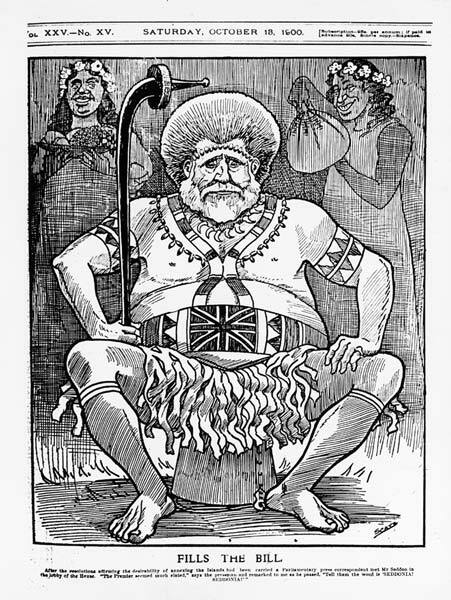 This 1900 newspaper cartoon depicts New Zealand Prime Minister Richard Seddon in mock Pacific Island dress, with a Union Jack flag on his waistband. The cartoon was a comment on the prime minister’s enthusiasm for Pacific empire-building. That year Seddon had toured the Pacific, visiting many of the islands. Like a number of other New Zealand politicians, he believed that the Pacific Islands were New Zealand’s first line of defence.